And here is the completed quilt; notice that the proportions have changed a little. The finished size for the exhibit is 36 inches wide by 48 inches long, so I needed to remove some extra, especially in the length. If the quilt hadn’t been in this exhibit, I might have let it go a little longer, but I think in terms of design and composition it is still fine the way it is. While I was mulling over how to quilt the walls, there was yet another discussion on either QuiltArt or SAQA (or both?) 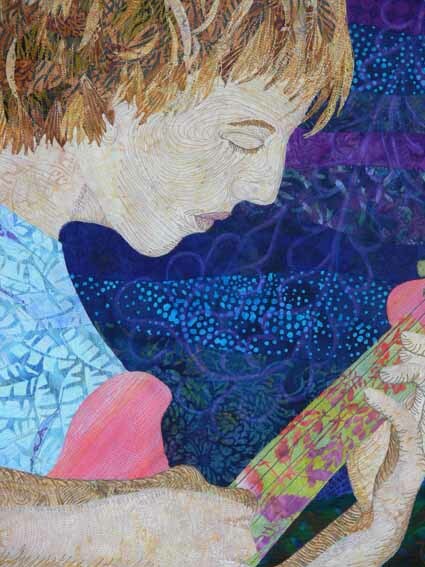 about the line between traditional and art quilting. 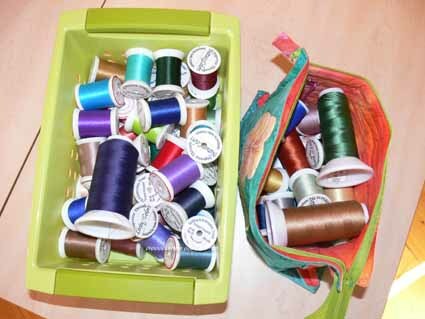 As usual there were those who want nothing to do with traditional quilting. I, however, am proud of our traditional roots and proud of this as an art form that began with women’s work. As someone recently said to me, Quilt is NOT a four-letter word! 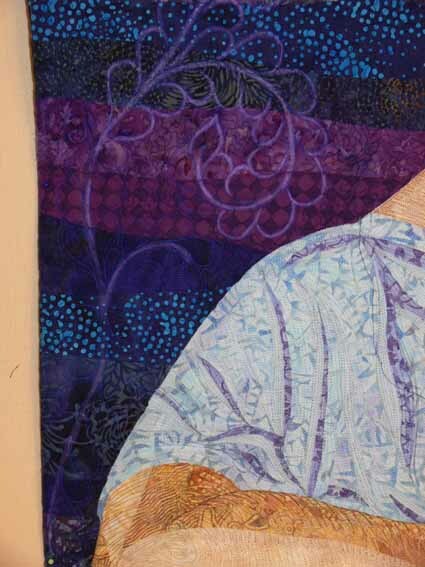 This discussion led me to the idea of using traditional feathered vines for the background quilting. As you can see from this next photo, though I chose a thread I thought would show up on the background, it was too subtle. I decided to echo-quilt around the feathered vines, then pencilled in the resulting space/channel to define the outlines of the vines with Prismacolor Pencil (which I later covered with a combination of a textile-friendly varnish and water to seal it to prevent it from rubbing off). Here is a wider-angled shot of the wall area showing the feathered vines…I just love them! I love the backs of my quilts, the line drawing look, so took this (alas blurry) photo–you can see the feathered vines clearly on this semi-solid background fabric, and that the entire quilt is stitched 1/4″ apart or close… a lot of thread! 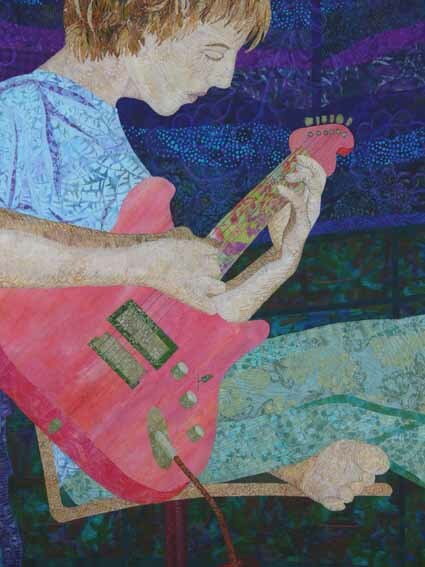 PS–I am reminded by the comments to add that Joshua –hallelujah!– actually likes the quilt! Given how picky teenagers are, especially of pictures of themselves, I am so thrilled that he of all people likes it. Hugs to my firstborn! Now…. 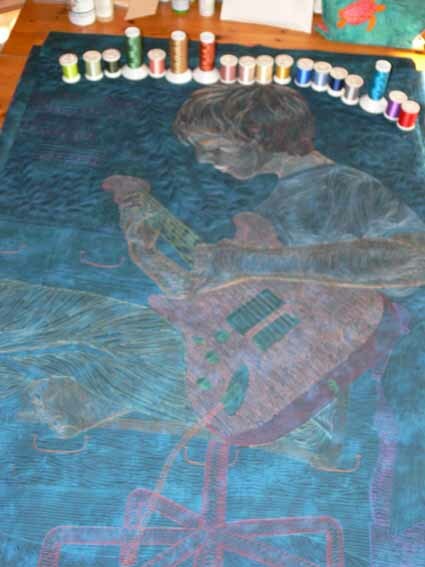 what will the years bring that I can do another quilt, this time of secondborn son? 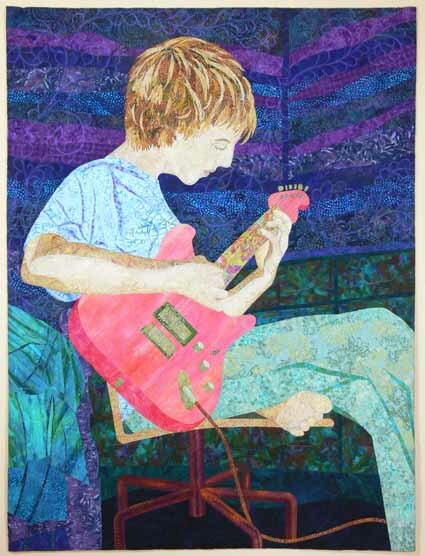 This entry was posted on Sunday, May 9th, 2010 at 3:09 pm	and is filed under Art, art quilting, In Progress quilts, Machine Quilting, QuiltArt e-list, SAQA, Techniques, Traditional quilting. You can follow any responses to this entry through the RSS 2.0 feed. Both comments and pings are currently closed. What an amazing piece of work Sarah. You are so talented. Joshua will be so happy with this quilt. That is an amazing piece of art work! Congratulations on finishing it! Gee, all those spools on his head make him look like his hair is in rollers! LOL (You might not want to tell him that). That is absolutely amazing. You are a very talented lady. 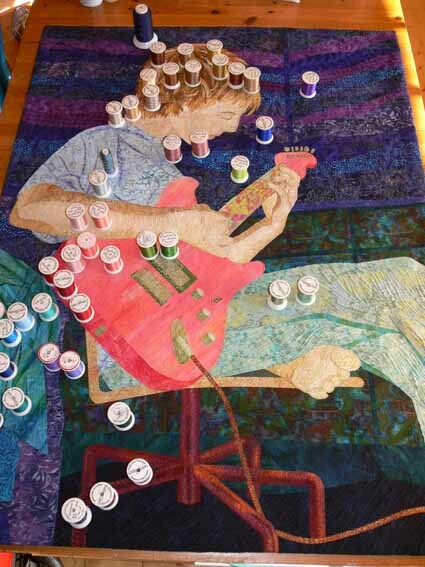 Well done..
Sarah, the quilt is incredible. Thanks so much for this step by step series. It’s been really informative and inspiring. As always, your tutorials are inspiring! You ROCK! It’s fantastic, Sarah. Your son must be incredibly proud!! Those feathers looks like ideas swirling around in Joshua’s head. I really love that so much! Sarah, what an amazing piece! All your work produced a masterpiece. oh what a wonderfull way you’ve quilted it, I like the downsizing you had to do, it feels like we’re almost breating down his neck. Like the back too, a lot!No fabrics distracting the eye from Joshua. Thanks for sharing! This turned out really well, another winner I am sure. Thanks for sharing your journey with us. Its really good Sarah. 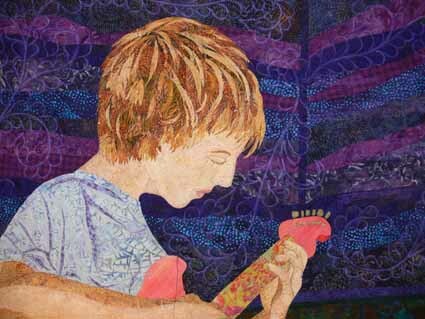 I am just thinking what kind of imagination you have and very well used in quilt. Amazing! Thanks for showing all the detail shots. 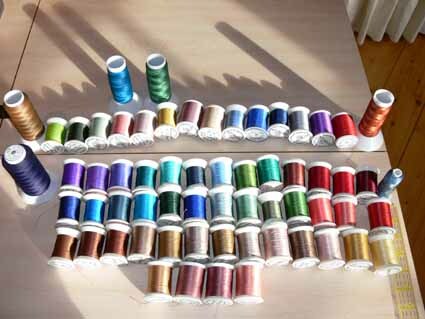 My favorite is the photo with all the threads sitting on top of where they were used.